International Nestlé-Free Week runs from 31 October - 6 November 2011. It is billed as a time for people who boycott Nestlé over the way it pushes baby milk to do more to promote the boycott - and for those who don't boycott to give it a go. The week begins on Halloween and boycott supporters are able to download "Nestlé-Free Zone" labels for goody bags for children, thanks to a supporter of the campaign in the United States. During International Nestlé-Free Week, Baby Milk Action is asking people to email Nestlé calling on it to stop promoting its formula with idealising health and nutrition claims, such as claiming its formula "protects" babies - a strategy Nestlé has rolled out in 120 countries according to an executive speaking at its 2010 AGM. It is also campaigning on specific practices recently highlighted in Armenia including distribution of free samples and promotional leaflets, and promoting complementary foods for use from too early an age. "During last year's event we asked people to back our call on Nestlé to stop promoting its formula as 'The new "Gold Standard" in infant nutrition' - and that worked. But Nestlé continues with other practices - such as claiming its formula 'protects' babies. The boycott will continue until Nestlé accepts our four-point plan for saving infant lives and ultimately ending the boycott. "Executives put profits before infant health, so the boycott puts a financial cost on their unethical baby milk marketing practices to offset the extra sales they make by undermining breastfeeding. The main target of the boycott is Nescafé, but we encourage people to boycott all Nestlé product, particularly during this week. Some people say they can't support the boycott because of a particular Nestlé product, so we ask them to try for at least this week and let Nestlé know. When people find alternative products are available, hopefully Nestlé will have lost another customer, at least until its changes it practices." Although Baby Milk Action can point to changes Nestlé has made in marketing policies and practices as a result of the boycott, Nestlé continues to reject the not-for-profit groups four-point plan for saving infant lives and ultimately ending the boycott. Nestlé said in response to the latest global monitoring report produced by the International Baby Food Action Network last year that it will act on just 3% of the violations of the international marketing standards reported to it, or just 4 of the specific cases in the Breaking the Rules, Stretching the Rules 2010 report, counting the discontinued "Gold Standard" leaflet amongst these. Nestlé drops "Gold Standard" claim following International Nestlé-Free Week 2010. Baby Milk Action is on-going communication with Nestlé about violations of the International Code and Resolutions, but generally finds executives refuse to change practices. The leaflet (left) was accordingly highlighted in International Nestlé-Free Week last year, which ran from 25 - 31 October 2010. 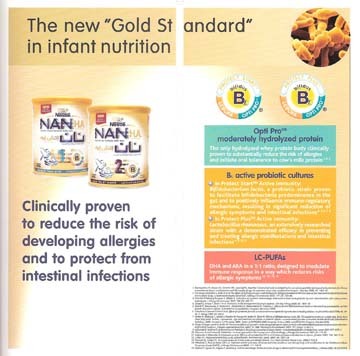 This leaflet for health workers claims Nestlé formula is "The new 'Gold Standard' in infant nutrition" (the example is from Dubai). 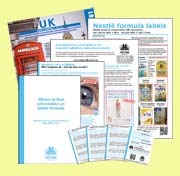 On 2 November, by which time Nestlé had received thousands of emails from members of the public, Nestlé replied to Baby Milk Action indicating the leaflet had been discontinued. Breastfeeding is usually referred to as the 'Gold Standard' and the International Code of Marketing of Breastmilk Substitutes is clear: "Such materials should not use any pictures or text which may idealise the use of breastmilk substitutes." 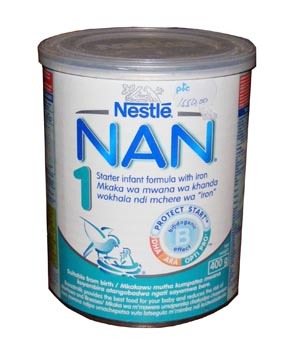 Baby Milk Action raised Nestlé 'protect' logos at the company's AGM in April 2010 after finding tins like this shown left around the world (this example is from a rural trading centre in Malawi, one of the poorest countries in Africa). Richard Laube, Head of Nestle Nutrition, responded defending the logos - which are prohibited under Article 9 of the International Code - and said Nestlé has rolled them out in 120 countries. Baby Milk Action continues to call on Nestlé to remove the logos and other health and nutrition claims, and campaigns to raise awareness of how Nestlé systematically violates the marketing requirements.